Globally, for effective food supply chain management and to maintain the quality of food, the technology advancement in packaging material and packaging type is propelling the growth of packaging industry. The growth in number of seafood consumers, food service industry, logistics sector and the technological advancements in packaging are driving the growth of global frozen seafood packaging. Other factors such as organic and inorganic packaging and product labeling signifying its expiration also impact the growth of the market. Food packaging accounted for 38.7% market share in 2016 of the total packaging industry, and frozen food accounted for 5.0% in 2016 of the total food packaging industry. There is trend of steampack packaging, whereby the frozen seafood is steam cooked in the microwave with lesser time and healthy cooking method, preserving its natural colors, vitamins and minerals. Steampack frozen seafood is expected to take over the market share over the forecast period. Zip lock packaging also has huge demand from the consumers majorly for the processed seafood which can be stored for further use. Further, seafood is prone to microbial growth and it requires effective antimicrobial packaging to increase its shelf life. Inadequate packaging of frozen seafood has accounted for loss of around 5 million tons of seafood every year. 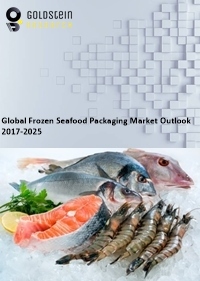 Goldstein Research analyst forecast that the Global frozen seafood packaging market is set to reach USD 281.3 billion by 2024, growing at a CAGR of 6.42% over the forecast period (2016-2024). Flexible packaging accounted for largest market share of 56.1% in 2016, backed by the factors like convenience to consumers and ecofriendly, which has negligible harmful impact to the content and to the environment and also has low cost of shipping as compared to rigid packaging. Based on geography, Europe accounted for the largest market share of 27.8% in 2016, for being the major exporter of frozen seafood majorly from Russia, Norway Netherlands and Spain. Russia alone exported USD 2.0 billion valued frozen seafood in 2016. Asia-Pacific closely follows Europe with China leading the market, backed by the fastest growing packaging industry in the region. The report covers the present ground scenario and the future growth prospects of the frozen seafood packaging market for 2016-2024 along with the market players’ analysis. We calculated the market size and revenue share on the basis of revenue generated from major players in the Global region. Global frozen seafood packaging market is forecasted on the basis of frozen seafood packaging production and supply. Global Frozen Seafood Packaging Market Outlook 2016-2024, has been prepared based on an in-depth market analysis from industry experts. The report covers the competitive landscape and current position of major players in the Global frozen seafood packaging market space. The report also includes porter’s five force model, SWOT analysis, company profiling, business strategies of market players and their business models. “Global Frozen Seafood Packaging Market Report” also recognizes value chain analysis to understand the cost differentiation, pricing models to provide competitive advantage to the existing and new entry players. Our Global frozen seafood packaging market report comprises of the following companies as the key players: Amcor, Crown Holdings, DuPont, Genpak, Bemis, Sealed Air, Ardagh Group, Mondi Group, Berry Group, LINPAC, DS Smith, etc.